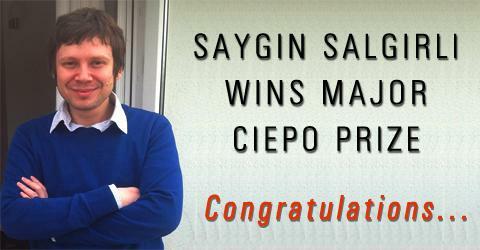 Dr. Saygın Salgırlı, a Visiting Faculty Member with Foundations Development and the Faculty of Arts and Social Sciences, has just been awarded the CIEPO (Comité International des Études Pré-Ottomanes et Ottomanes) prize for "the best original article in a field of pre-Ottoman and/or Ottoman Studies written and published by a young scholar." Dr. Salgırlı's award-winning article is a study of the famous Sheikh Bedreddin revolts in Ottoman History: "The Rebellion of 1416: Recontextualizing an Ottoman Social Movement," which appeared in JESHO (The Journal of the Economic and Social History of the Orient), Vol. 55, No.1 (2012), pp 32-73. Saygın Salgırlı finished his Sabancı University History MA in 2003, after which he went on to a Medieval History and Art History PhD at SUNY Binghamton (2009). In recent years he has been teaching, coordinating, and helping revise SPS 101 here at Sabancı.